This BioProvine (as defined by Armen Takhtajan) includes the granitic Seychelles and the associated low sand cay islands of the Amiranthes situated in the equatorial regions of the Indian Ocean. The larger islands including Mahé and Praslin are thought to be fragments of the original landmass of Gondwanaland and are therefore considered to be of considerable biogeographical interest. The largest island, Mahé with an area of about 152 square kms rises to a height of 905 m in the upland of Morne Seychellois. All of the larger islands have rugged granitic mountains often with smooth, bare rock slopes known as glacis. These rocks are reputed to be over 500 million years old. The islands experience a humid, tropical climate with maximum rainfall in summer but this is strongly influenced by altitude and aspect. Of the 859 recorded vascular plants including 85 ferns and fern allies, there are 9 endemic or near endemic genera (Deckenia, Lodoicea, Medusagyna, Nephrosperma, Phoenicophorium, Protarum, Roscheria, Vershaffeltia and Wielandia), and about 100 endemic flowering plants. 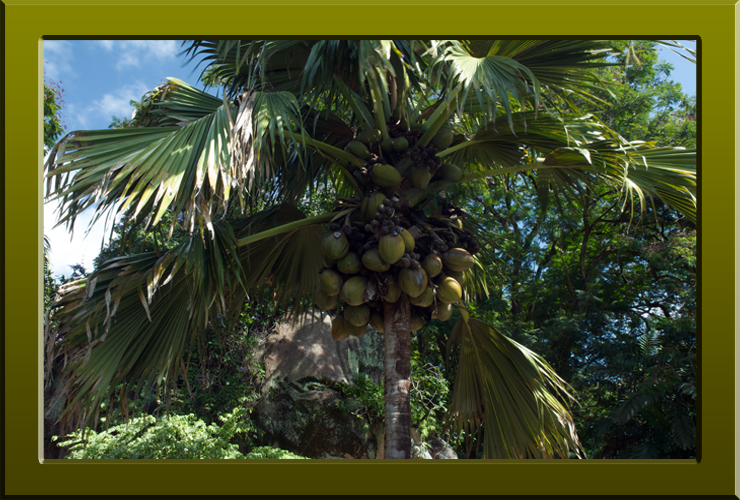 The well-know endemic palm Lodoicea maldivica (coco-de-mer) has the largest seeds in the World, and seems to be the only case of ‘island gigantism’ in the Seychelles flora. The large number of endemics supports the idea that the terrestrial environment of these islands is of considerable antiquity. However, the diversity of forest species, at least among canopy forming trees, is much lower than typical rain forests, and this may be one of the reasons for the relatively large number of palms and pandans among dominant species. Another interesting feature is the virtual absence of lianas and there are no stranglers. Epiphytes are abundant but there are no native epiphytic Araceae or Bromeliaceae. Among the native trees there are no buttress-roots as is often the case in rain forest but many species have well developed stilt roots. Seed dispersal is mostly by fruit bats or fruit-eating birds. Wind dispersal is thought to be a disadvantage to plants growing on small oceanic islands, and in fact, Medusagyne oppositifolia is the only endemic tree with wind-distributed seeds. This has prompted the idea that this species evolved on a much large landmass. Lodoicea maldivica (Arecaceae) the famous coco-de-mer a palm endemic to the Seychelles and with its double coconut has the largest seed in the plant kingdom (Copyright © 2010 Peter Martin Rhind).